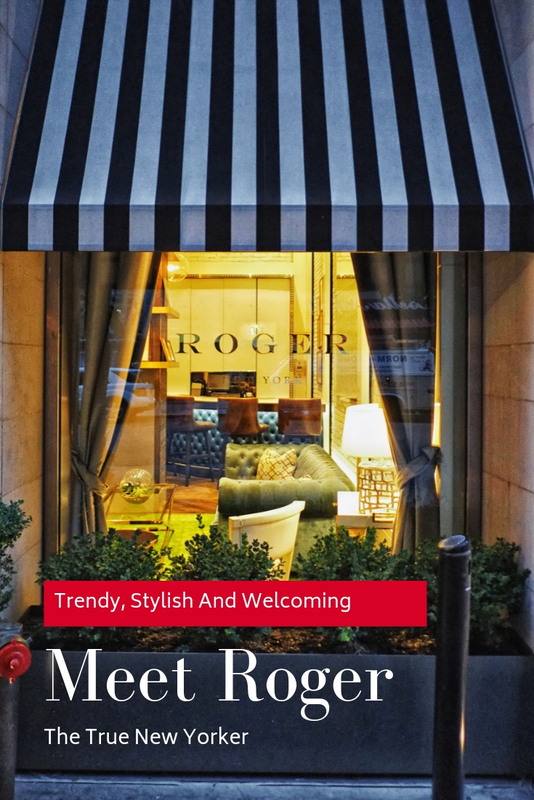 Situated on Madison Avenue in the trendy Murray Hill neighbourhood, Midtown Manhattan; The Roger is everything I expect from a native New Yorker. Welcoming, trendy and stylish. 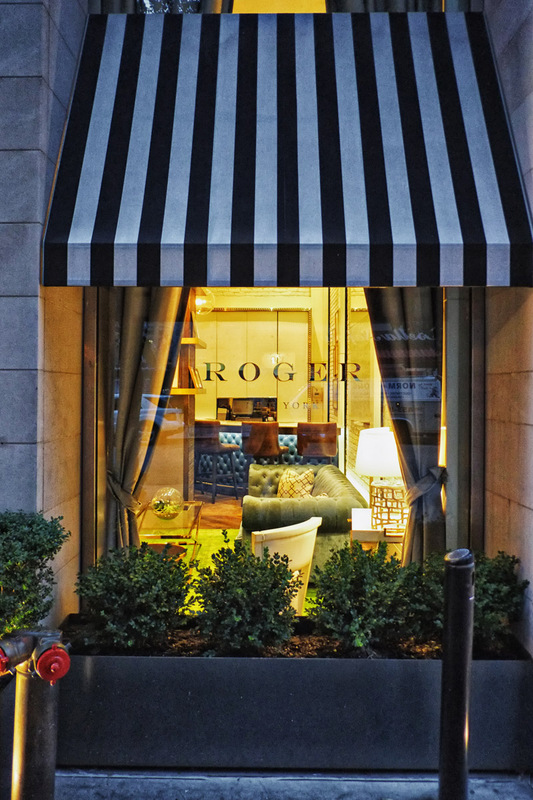 The moment Kent and I stepped into The Roger, its chic lobby design: the blue velvet sofas and vintage rugs, herringbone patterned floorboards; high ceilings and framed black and white celebrity photographs, made an immediate and lasting impression on me. Not just any celebrity photos, Marilyn Monroe, Elizabeth Taylor; the Rolling Stones to Jay-Z, all taken in New York, unpublished, unseen, that is until now. Yes, The Roger is definitely proud of its DNA! I found marvellous and inviting large blue velvet chesterfield and chaise lounges radiating comfort. ‘I want to spend as much time here as I can.’ I said to myself from the moment I laid my eyes on them – but I couldn’t just stay in, I was in New York after all! Fancy a quiet drink? 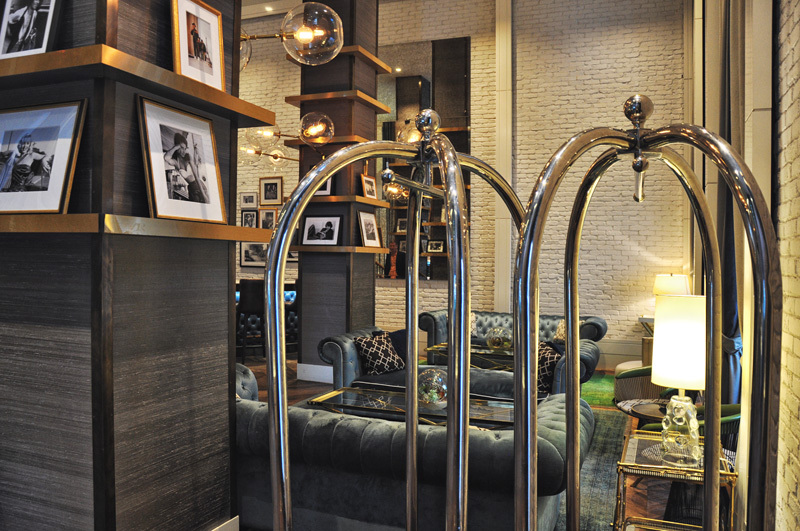 There’s also a 5-seat marble topped corner bar, making this cosy space a perfect place to hang out. 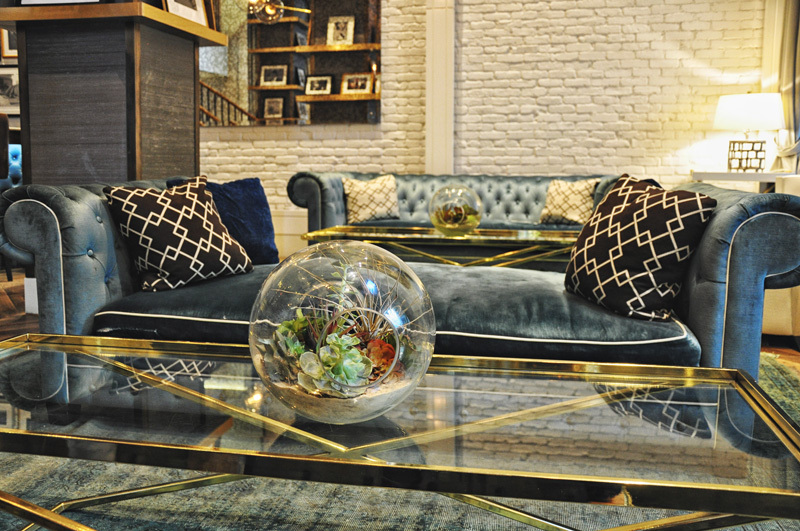 I also like the finishing touches in the lobby, the distressed wall mirrors and crystal glass terrariums, adding a little edginess and quirkiness to this ideal meeting spot. From the lobby area, a timber and metal staircase leads up to The Parlour Bistro and Lounge, the hotel restaurant which also serves buffet breakfasts every morning. The room decor at The Roger is modern and sleek. 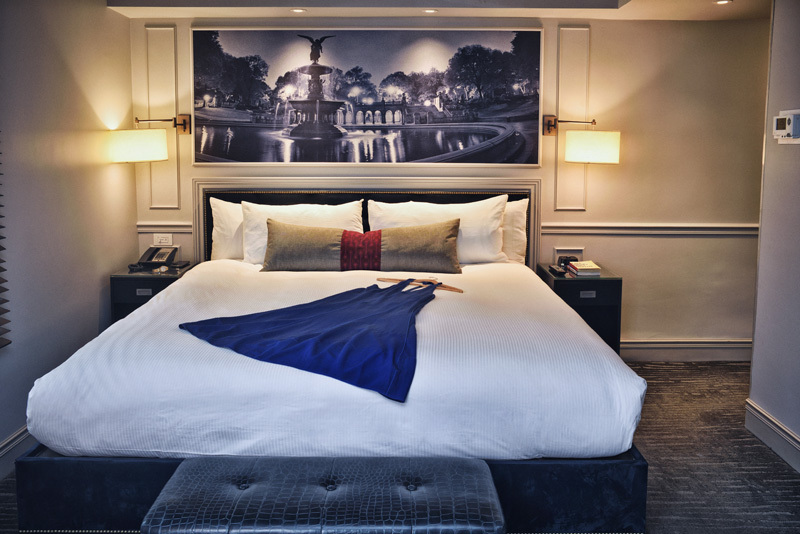 An art photo of Central Park’s Bethesda Fountain at night sets the tone; the bed is large and comfortable made up with Egyptian linen sheets. 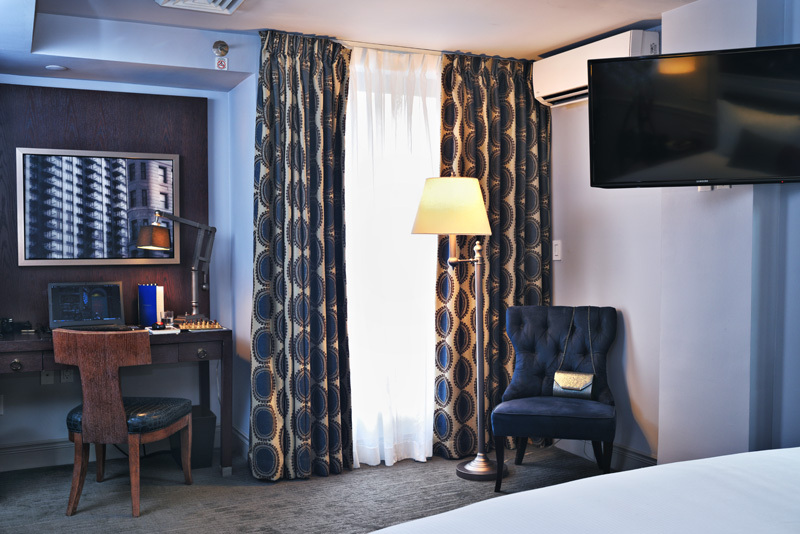 There is a desk, a flat screen TV; mini bar, a safe for your passport or other valuables; air conditioning, CO Bigelow bath products and bathrobes upon request, basically everything you need for a comfortable home away from home experience. We split our 6-night stay into two Premier Terrace rooms so we’d have more material to share with you. 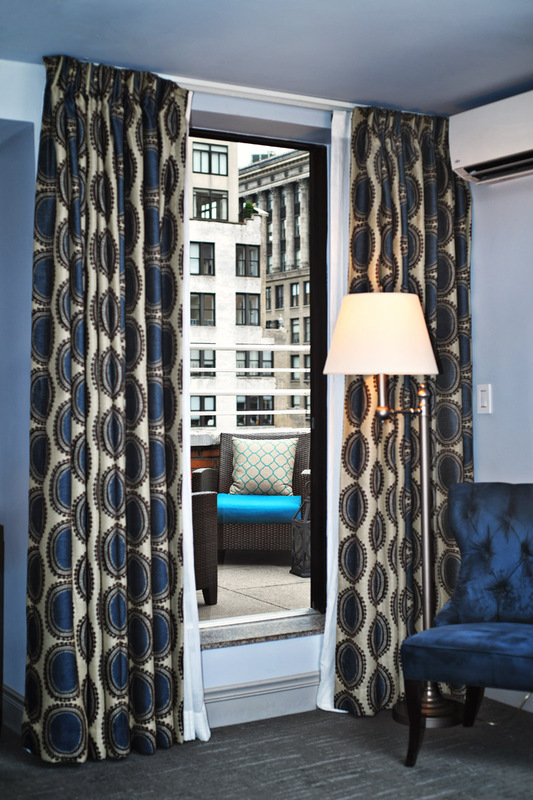 Our first room was sizeable, had a terrace with real New York views of, well other New York buildings! Fascinating to Kent and I and we had spent our late afternoon sipping drinks and looking out at this slightly closed-in New York skyline and recovering from that long haul journey from Sydney, and our first day out in NY proper. 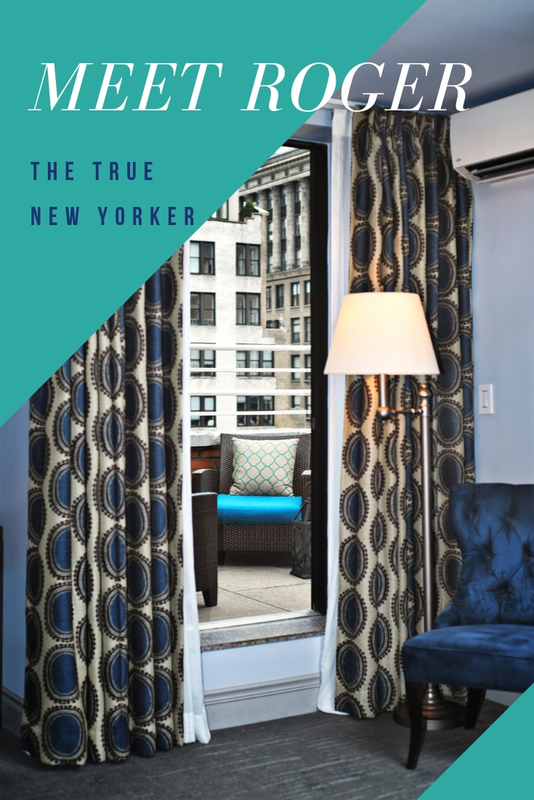 Now our second terrace room, well it was literally in the shadow of the Empire State Building. The room and the bathroom were smaller compared to our first one, but a balcony with a view overlooking the Empire State Building made up for a small reduction in floor space. During our stay which coincided with New York Fashion Week, Kent even used our terrace for some shots he did for Mario and Lee (a young New York fashion label) The Versed capsule collection with a handsome male model. And of course, we did a fashion story for White Caviar Life on this very terrace too! How did it go? Stay tuned and see for yourself! Bagels! New York equals bagels! 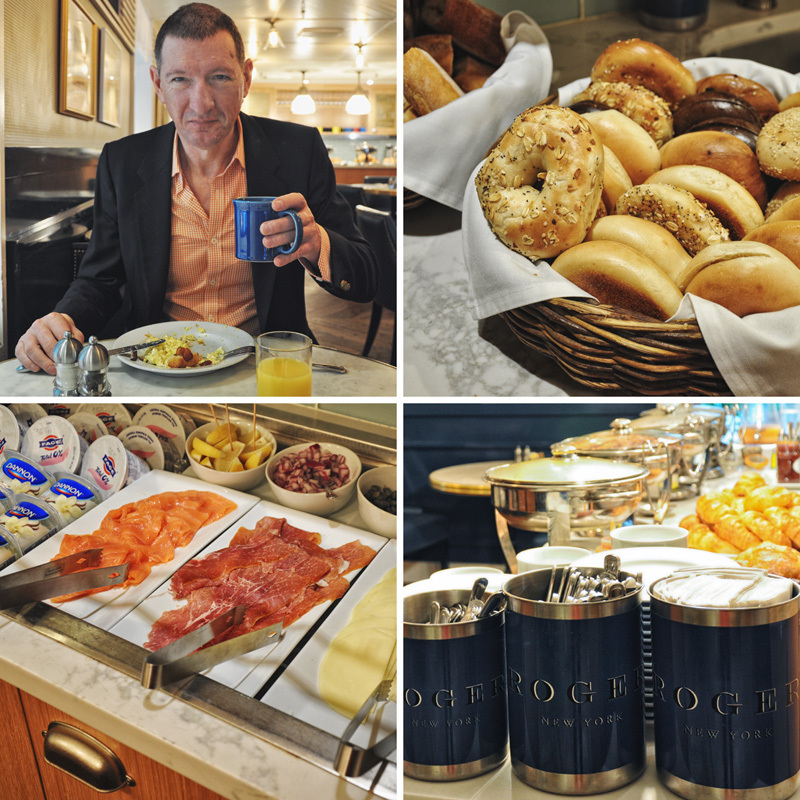 During our time in Manhattan, I was after the classic New York City breakfast like the popular smoked salmon and cream cheese bagel; I was excited about selecting my own bagel toppings with a whole basket of different types of bagels in front of me, decisions, decisions… Or there’s fruit salad, ham; cheeses, yogurt; blueberries, croissant and other pastries are among the cold buffet choices. If you prefer a hot breakfast like Kent does, there’s scrambled eggs, bacon; sausages and potatoes to choose from. We also tried a room service breakfast, out on our terrace, with the glorious blue sky and that late summer sun; light breezes and a jolly holiday mood… A view of the Empire State Building jutting out into the blue American sky… Did we need any more excuse to dial that room service number? I think not! 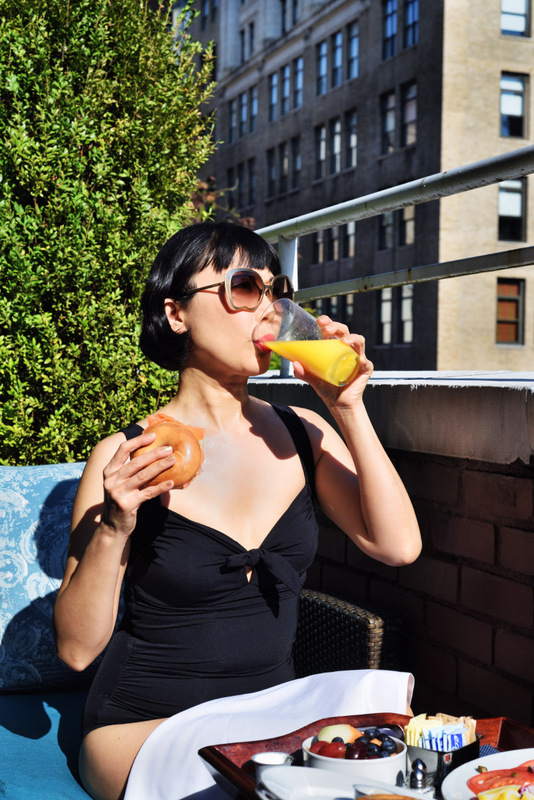 So here I am in my bathing suit, sun baking while enjoying breakfast – room service style! Life is definitely sweeter from a balcony with a view! ‘King Kong’, ‘An Affair to Remember’ and ‘Sleepless in Seattle’, no doubt these movies sound familiar to you! They certainly have something to do with making the Empire State Building one of the most famous buildings in the world. 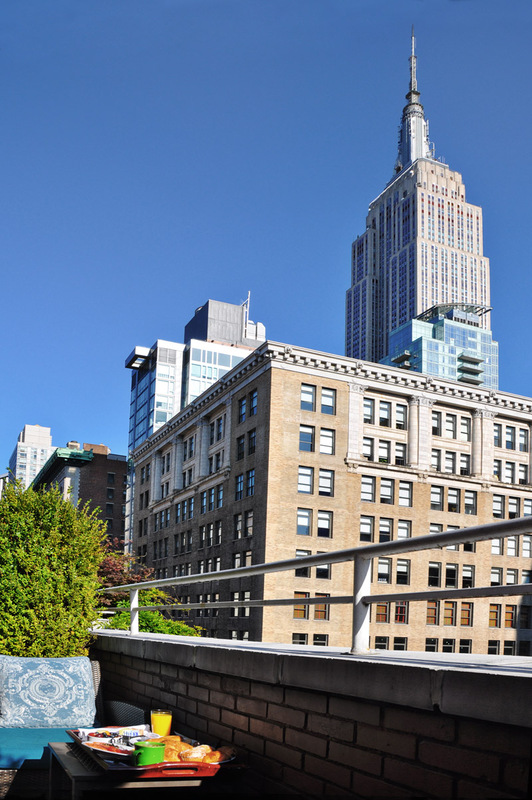 Completed in 1931, this Art Deco skyscraper is currently the 5th tallest in the United States and it is only two blocks away from The Roger. Truly the only way to avoid seeing it is to be in it! 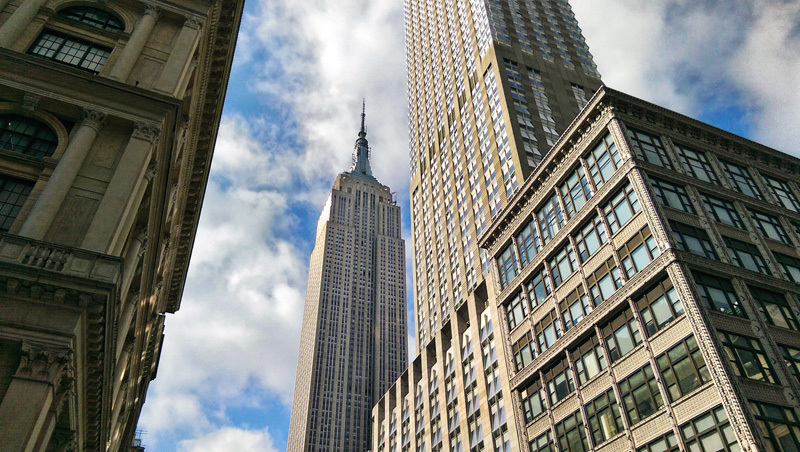 During my first New York holiday I did manage to go up to the 86th-floor observatory; this time around, Kent didn’t like the height and I wasn’t keen on the new ticket price (it has gone up a lot in 16 years), therefore we passed on it. Of course now he is regretting not getting any of those birds eye views of New York photos! Oh well, maybe next time! 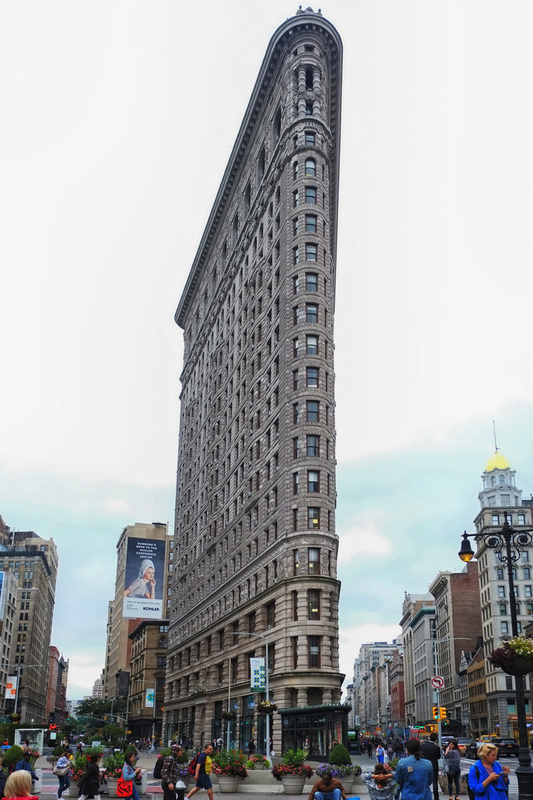 A short walk from The Roger in the other direction, the Flatiron Building is yet another famous eye catching landmark in Midtown Manhattan. We took a walk around the neighbourhood, and that was the first time I saw this triangular steel-framed building so closely. ‘It looks so much taller than its 22-story height!’ As I kept saying to Kent. ‘Perhaps it’s the astonishing narrow shape of it!’ Well, that makes sense. Beautiful Madison Square Park is an urban green space that connects Flatiron District and NoMad (North of Madison Square Park). The park is literally a 5-minute walk from The Roger. I met this gorgeous, not to mention super cute little fellow, a grey squirrel at the park. 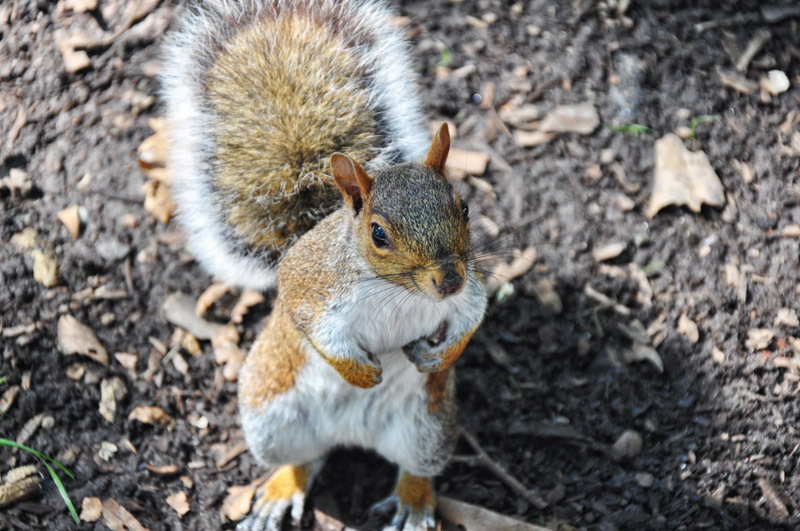 Not at all shy, he came straight to me hoping I’d feed him some nuts; instead, I captured this image above. As soon as he realised he’d been hustled and I didn’t have treats for him he was off! These urban squirrels are among my most unforgettable New York experiences since the very first time I saw them at the Central Park back in 2001. They ‘had me at hello’ and I was always thrilled to see them! 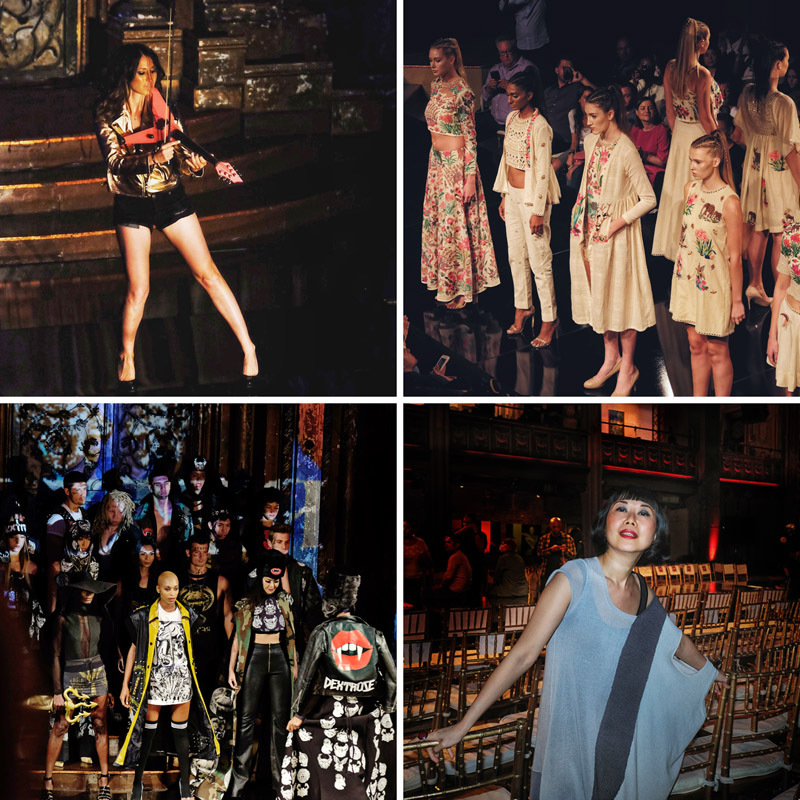 Clockwise from top left: 1) Sarah Charness (AKA Sarah pink violin) opens the show at the Art Hearts Fashion NYFW. 2) Purvi Doshi’s NYFW collection. 3) New York Fashion Week here I come! 4) Dexter Simmon’s theatrical finale wraps up the day one show. This trip really started here, thanks to vivalaViv, my humble little personal style blog which has (even though it’s Sydney based) been receiving invitations to Art Hearts Fashion shows throughout America since 2015. Last year, as soon as the New York Fashion Week invitations started to arrive for September shows, I thought: ‘Could there be a better reason to be back to the Big Apple?’ ‘September is the BEST month to be there!’ And of course, Kent, being a fashion photographer and a fan of all things New York, needed very little encouragement to persuade him to pack his bag and board that plane with me. But why were there 16 years between my two visits to New York City? I often wonder about that myself! Some friends suggested that witnessing the 911 tragedy first-hand during my first American trip was too dramatic an experience to cope with. Is it the reason? I’m not too sure but what I do know is, that story belongs elsewhere to this one; however it is also one I want to tell and I will be sharing it later. Although we didn’t try The Parlour Bistro and Lounge for dinner, and with so much walking, we didn’t once use the hotel gym. We did love the fast Wi-Fi so Kent was able to backup our photos to the cloud every day. We enjoyed the weekdays’ Wine Hour and meeting fellow guests (stay tuned for The Roger Part 2); free morning tea and coffee provided in the lobby and the friendly, helpful hotel team. Thank you for your assistance and booking our table at the Grand Central Oyster Bar & Restaurant for us! Will we stay at The Roger in New York City again? Absolutely! Great post. Thank you. Looks like I’ll put New York at the top of my travel list. Thank you for sharing with us. 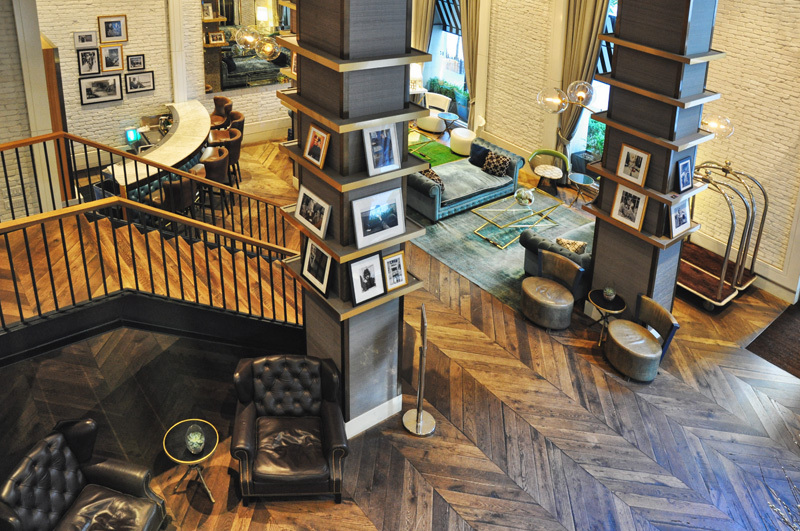 This hotel sounds ideal, I travel to New York frequently, will check it out! An informative, ‘easy read’ to enjoy. Thank you for taking me back to New York City! You are welcome Ted. Thank you!